We’d love your help. Let us know what’s wrong with this preview of A Short History of Disease by Sean Martin. To ask other readers questions about A Short History of Disease, please sign up. Quite good, with a lot of information about the common evolution of diseases and human society/race. Plenty of useful, little known and often surprising details about the ”plagues” that tormented humanity and the never-ending war against them. One star less than 5/5 because I felt that the historical part was not as well developed as the medical one (I expected more about the impact on the fall empires etc.). This book is just ok. I found some of the history interesting because there were details about epidemics that you don't learn in history class. The section on the Bubonic plague during the Middle Ages is very enlightening. However, the book has some major flaws. 1) The entire chapter titled "Antiquity" is pure speculation. Trying to make sense of anything before written history or even early written history is ridiculous. Early written history is subject to the interpretations of the individuals This book is just ok. I found some of the history interesting because there were details about epidemics that you don't learn in history class. The section on the Bubonic plague during the Middle Ages is very enlightening. However, the book has some major flaws. 1) The entire chapter titled "Antiquity" is pure speculation. Trying to make sense of anything before written history or even early written history is ridiculous. Early written history is subject to the interpretations of the individuals who are interpreting the language into modern language. All sorts of things can go wrong there, primarily a loss of the context in which the original writer documented the event. Pre-history that was passed along as oral story telling and then eventually written down, like the Bible, is not even worth wasting time exploring yet this author expends a lot of words to try to convince you that we can determine what those plagues may have been. In addition, as we get into the chapters "The 20th Century" and "New Diseases" there is more evidence that this author is not exploring disease with the science of it in mind. On page 206, the author actually gives credit to the hypothesis by conspiracy theorists that AIDS is the result of polio vaccine research going awry. Conspiracy theorists claim that in the early days of polio vaccine research, cells from monkeys were used, and those cells were injected into people in Africa thus causing the AIDS epidemic. The author states that "...the Oral Polio Vaccine theory, has largely been discredited," but then continues with the thought "although the earliest known cases of HIV do seem to have come from the Democratic Republic of Congo." So, he's not entirely dismissing this conspiracy theory. In the chapter "New Diseases," the author uses the phrase "Big Pharma" and spends several paragraphs how capitalism could be seen as a disease because "drug companies have orchestrated this massive upswing in drug prescribing to their advantage." There is also a hint of isolationism in the author's concluding statements, such as buying locally grown, organic food to follow the Hippocratic ideal that "food shall be our medicine." In other words, if we change the way we live, eat, and buy (eat organic, live locally instead of travelling, and buy locally) then we can prevent future diseases. Claims like these get into the logical fallacies of "Claims of Antiquity" and "The Natural Fallacy," that is, all things that we used to do in the past were "good" and all things natural are "good." Lastly, the author mentions the recent phenomenon where parents fail to vaccinate their kids because of fear of autism but he does nothing to explore that or to even mention the fact that those claims have been long discredited (the book was published in 2015). Ever since finishing grad school, I've been interested in books about health and disease. That, and my career, made me interested in reviewing this book through NetGalley. I am unfamiliar with the author, who appears to have written some other histories. However, this one has a very broad scope--from paleolithic to modern times. The focus is on infectious diseases, as those have been a leading cause of death for most of humanity's existence. This breadth means that things are necessarily simplif Ever since finishing grad school, I've been interested in books about health and disease. That, and my career, made me interested in reviewing this book through NetGalley. I am unfamiliar with the author, who appears to have written some other histories. However, this one has a very broad scope--from paleolithic to modern times. The focus is on infectious diseases, as those have been a leading cause of death for most of humanity's existence. This breadth means that things are necessarily simplified, which is fine for the general public, but those who are more familiar with certain issues may quibble with his approach. The book has a heavier emphasis on Europe, England, and the USA than the rest of the world, perhaps because of the availability of source material in English. However, there is coverage of events, approaches, and advances from China, Africa, and the Middle East. The thing that sticks out most to me, though,is how poorly we have behaved as a species to one another when faced with disease. Fear, blame, denial due to greed, violence, all have been too frequent responses to outbreaks of infection. The author gives enough detail to be disturbing, but not enough to make one nauseous. I was glad for the lack of images, as many would have been gruesome. As I mentioned, the book is focused on infectious diseases. There is a short section on chronic diseases. However, their impact has been quite minor in terms of illness and death until the past 60 years or so. And, in many parts of the world, infectious disease is still the leading cause of sickness and death. However, I was surprised that illnesses such as gout were not mentioned, other than that a historical figure suffered from it. The author's conclusions, that diseases of all kinds can be reduced through sanitation, lack of crowding, good nutrition, clean air and water, etc., was interesting to me, and may be a point of disagreement for others. Overall, I found this an accessible history that discussed the diseases that have shaped us as a species, including how we acted because of them and how they led to changes in our societies. I think this would of particular interest to those who care about population and public health, or who would like to read a different take on history. Diseases have shaped out past as much as many famous events. This is a wonderful primer on disease whether or not you have any medical background. Well written, everything is clearly and simply explained. The book does a great job of taking you through the history of disease and man's experience with it. I received this book for free as part of an early reads program but the opinions expressed are solely my own. Great introduction and interesting revelations on diseases (origins, names, mutations), but some biases. After reading David Quammen's Spillover, I read this in an attempt to broaden my understanding of diseases in general, which it did and more! It was immensely readable, and covers the side of disease I am most interested in, namely the social history of disease and disease management. With lots of first-person quotes scattered throughout and legitimate compassion for those who have passed away in epidemics, the author brings to life the impact of diseases on ordinary people, even as far back as After reading David Quammen's Spillover, I read this in an attempt to broaden my understanding of diseases in general, which it did and more! It was immensely readable, and covers the side of disease I am most interested in, namely the social history of disease and disease management. With lots of first-person quotes scattered throughout and legitimate compassion for those who have passed away in epidemics, the author brings to life the impact of diseases on ordinary people, even as far back as thousands of years ago. He also drew meaningful connections between public health responses and other contextual factors for each situation, such as war, money, trade and cultural practice, which I found incredibly useful to envisage the hows and whys of government responses to crises. Great overview/taster for disease generally (there's some science, some humanities, a good mix). I loved it and will be lending it out to everyone because it's an quick, entertaining read whilst being informative. I gave it five stars because to me it fulfils its purpose very well and I thoroughly enjoyed it. Some diseases have been helped through human intervention of a different kind. Fearing that certain vaccines might lead to conditions like autism, many parents have refused to get their children vaccinated... if we're going to count capitalism as a disease for a sake of argument, then we should probably also label stupidity as one. A Short History of Disease ditulis begitu sistematis dengan urutan waktu dari awal kehidupan sampai abad milenial. Buku ini merangkum secara singkat dan tepat segala Some diseases have been helped through human intervention of a different kind. Fearing that certain vaccines might lead to conditions like autism, many parents have refused to get their children vaccinated... if we're going to count capitalism as a disease for a sake of argument, then we should probably also label stupidity as one. A Short History of Disease ditulis begitu sistematis dengan urutan waktu dari awal kehidupan sampai abad milenial. Buku ini merangkum secara singkat dan tepat segala peristiwa yang terjadi sebelum dunia kesehatan maju seperti saat ini, dimana bakteri dan virus telah lama hidup dan berevolusi bahkan sebelum peradaban maju manusia, salah satunya adalah kuman Mycobacterium Tuberculosis yang telah ada sekitar 7000 BC (based on this book). Faktanya, kuman itu terus berkembang sampai saat ini. Buku ini menggambarkan bagaimana manusia mencoba untuk memahami dan melampaui segala penyakit yang ada di alam semesta. Para ilmuan berbondong-bondong melakukan segala cara untuk meneliti sifat dari penyakit, apa penyebabnya? siapa vektor nya? apa saja faktor risikonya? bagaimana mencegah sekaligus mengobatinya? Di saat titik temu sudah muncul, di saat manusia merasa yakin bahwa mereka sudah menaklukan para bedebah-bedebah kecil yang tak kasat mata itu, mereka ternyata berevolusi lebih cepat dibandingkan manusia. Kehidupan yang lebih baik juga membentuk penyakit-penyakit baru, yaitu penyakit kronik yang berhubungan dengan gaya hidup dan pola makan. Obesitas yang berujung dengan Diabetes lalu berakhir dengan penyakit kardiovaskular. 1. I didn’t need nor care for the simplistic ideological musings of the author mixed in with what’s supposed to be a factual account. The parts about capitalism being a disease (even though the criticism of colonialism is legitimate, the complete disregard of the role capitalism played in the development of modern medicine and public health policies, vaccines and so on shows a certain ideological blindspot), Big Pharma pumping us with pills we don’t need, the luddite fear of globalism and technological development, and the downright hippie advice of eating organic, locally grown food and turning to ancient texts to find cures for new epidemics made me cringe. 2. Sean Martin doesn’t have a background in medicine and it sometimes shows. Neither, I suspect, is he a trained historian. 3. The writing isn’t great. It reads a bit like an amateurish textbook, and whenever Martin alludes to his own views it’s like nails on a chalkboard. While this book stays a bit on the surface where it concerns the medical science, it does cover a LOT of ground. You're curious about diseases in Antiquity? This book has got you covered! (Admittedly, there's a lot of supposition going on in that chapter but this is not hidden, either). More interested in the Black Plague? Yup! Ready to get the willies while reading about modern menaces like ebola and SARS? Just keep going! All the information is well-presented and never did I have the feeling the While this book stays a bit on the surface where it concerns the medical science, it does cover a LOT of ground. You're curious about diseases in Antiquity? This book has got you covered! (Admittedly, there's a lot of supposition going on in that chapter but this is not hidden, either). More interested in the Black Plague? Yup! All the information is well-presented and never did I have the feeling the author was talking down to me, which is often a trap in popular science books. Overall, I enjoyed the read itself and feel smarter for having read this book! Informative and concise, with some very vivid descriptions of some horrible diseases. Good example of what non-fiction should be. 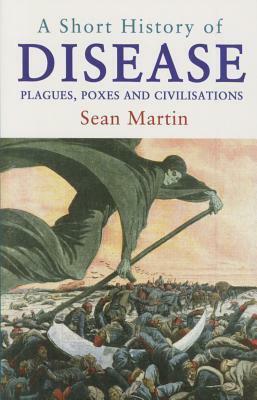 A Short History of Disease by Sean Martin is a very highly recommended concise, easy to read history that presents a good overview of infectious and non-infectious diseases. The book begins with definitions and origins and then is divided up by time periods, from prehistory to modern times. "Analyzing case studies including the Black Death, Spanish Flu, cholera, leprosy, syphilis, cancer, and Ebola, this book systematically maps the development of trends and the latest research on disease into a A Short History of Disease by Sean Martin is a very highly recommended concise, easy to read history that presents a good overview of infectious and non-infectious diseases. The book begins with definitions and origins and then is divided up by time periods, from prehistory to modern times. "Analyzing case studies including the Black Death, Spanish Flu, cholera, leprosy, syphilis, cancer, and Ebola, this book systematically maps the development of trends and the latest research on disease into a concise and enlightening timeline." Naturally anything with such a broad scope is not going to contain an exhaustive amount of information covering every faucet of every disease. It does have a nice balance of history and diseases, including how society has handled them over the decades - and spread them. Contents include: Introduction: Definitions, Origins; Chapter One: Prehistory; Chapter Two: Antiquity; Chapter Three: The Dark and Middle Ages; Chapter Four: The New World; Chapter Five: Early Modern to 1900; Chapter Six: The Twentieth Century; Chapter Seven: New Diseases; Notes, Glossary of Diseases, Bibliography, and Index. I'll freely admit that I have a fondness for books on diseases and outbreaks of various epidemics or pandemics, so this accessible survey of diseases is right up my alley. I thought Martin did an excellent job presenting the history of diseases in a way that doesn't seem too daunting or overwhelming while including a wealth of pertinent information. As is also my wont, I was thrilled to see that A Short History of Disease includes notes, a bibliography, and index. I really liked the inclusion of a glossary of diseases which I think could be helpful for the novice. I didn’t want to hear about his hatred of the free market. But, he did very well with a summary of history’s diseases.